After Milwaukee County Sheriff David A. Clarke, Jr., made a controversial appearance October 29 on FOX-TV and days later accompanied by one of his top staff members sought a confrontation with Milwaukee County Executive Chris Abele, Milwaukee County Supervisor Supreme Moore Omokunde said Sheriff Clarke’s recent behavior “is beneath the office of the Sheriff.” On Fox and Friends, during an interview Sheriff Clarke said members of the Black Lives Matter movement were not protestors, but saboteurs whose intent is to overthrow the U.S. Constitution. He went on to suggest that instead of providing police protection for Black Lives Matter demonstrations, police should withdraw and allow citizens inconvenienced by traffic disruption to vent their anger at the protestors “then when there is a disturbance we can show up and arrest these sub-human creeps….” he said. 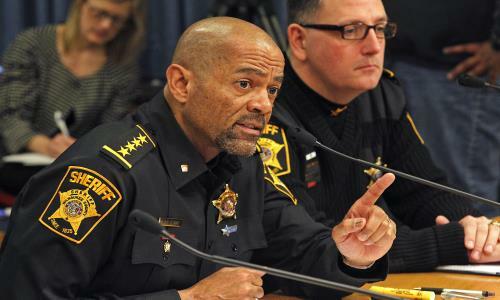 Days later, the Milwaukee Journal Sentinel reported that Sheriff Clarke, accompanied by Inspector Edward Bailey, Adjutant to Sheriff Clarke, sought a “provocative and confrontational behind the scenes (encounter) at the Milwaukee County Courthouse” with County Executive Chris Abele. Abele was being served a summons and a copy of a lawsuit filed by Milwaukee County Board of Supervisors Chairman Theo Lipscomb, who denied asking that the Sheriff hand deliver the court document. “I have made it a point to be extremely polite, courteous and professional with (Sheriff Clarke) during the County Board’s Finance committee hearings, and I’ve even overlooked my personal issues with him in voting to allocate $4 million to his department’s budget in the interest of public safety,” said Lipscomb.